CEDIA NEWS: B&W upgrades design of XT4 and CM series speakers | What Hi-Fi? 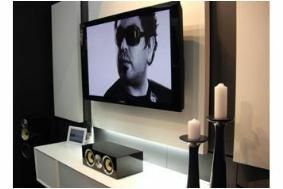 Here at CEDIA Expo the new shiny black CM speakers (pictured) are on show. They cost the same as other finishes in the range, so that's £1000 for the CM7, £500 for the CMC centre speaker and £500 for the CM2. There's also a new compact subwoofer. For those who want a high-quality in-wall speaker, B&W has developed a custom install version of the 800D model, called the CT8LR. They'll set you back a cool £10,250 each. If that's a bit outside your price range, there's the slightly smaller CT8.4, a new addition to the CT800 range, a mere snip at £2750. They can be used as front left and right, centre or rear speakers to make up a complete 5.1 system. There's also a new design for the XT4 floorstanders on display here at the show, but it's only a prototype and the real one won't be available until next year. B&W is keeping tight-lipped about the changes in store.